TypeTastic is a fun (and free!) tool that is revolutionizing the way children learn to type. Parents enjoy interacting with their child at home with TypeTastic as much as the child has fun doing it. As a matter of fact, parents may even want to play the games themselves! Want to learn more about playing while keyboarding and hear from real-live parents who use this fun tool? Well, read on. Amanda Boyarshinov regales readers of her blog, “The Educator’s Spin on it,” with the tale of how her 4th-grade daughter needed to have a five-paragraph research project turned in, TYPED, even though she had ever typed before. Ever. Her daughter hunt-and-pecked the entire three pages, and tears were shed by mother and daughter both. That’s when she decided she wasn’t going to let her kids go through something like that again. With TypeTastic, her kids are improving their own typing skills. Maegan Blue’s kiddo happens to have dysgraphia, which is a fancy way of saying he has a hard time with writing. We all know how many jobs and everyday tasks rely on computers these days, and writing and typing are essential skills for success, so she was thrilled to have the chance to review TypeTastic on her blog, “Sounds Fun Mom!” She personally saw her son dramatically improve his fluency after just a couple of lessons on TypeTastic, and he didn’t even complain (much). 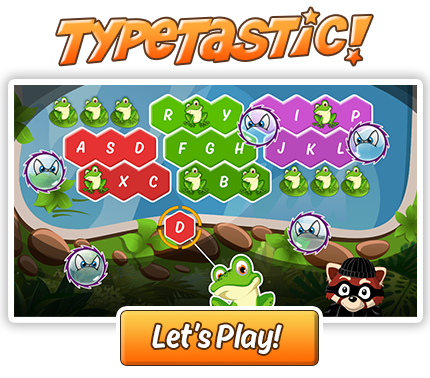 TypeTastic!—Play Your Way Into Typing! Sometimes a child’s parent and teacher are one and the same, like Carisa Hinson, who homeschools her three kids and blogs at “1+1+1=1.” Carisa loves TypeTastic so much she plans to have her 3rd-grade daughter work through the TypeTastic program to help improve her keyboarding skills. Her kiddo loves it so far, and has little idea how much learning is going on while she is playing games on the computer! Stephanie Jankowski’s 2nd-grade son told her he hates learning to type, because “it’s boooooring.” While typing is an important skill for students to learn, Stephanie didn’t see why it couldn’t be fun as well. On her blog, “When Crazy Meets Exhaustion,” she writes about how TypeTastic is the perfect solution for the problem of the “boring typing class. It’s visually engaging, free, and builds skills incrementally, so kids can learn at their own pace without getting frustrated! TypeTastic is a win-win for parents and kids! Children learn to type while playing, and parents get to enjoy seeing their kiddos play while knowing that they’re learning a skill that will be a huge help to them in school and their 21st-century career. Now isn’t that TypeTastic!? Click here to try it for FREE with your kids! Already tried TypeTastic? We’d love to know what you think! Connect with us on Twitter or Facebook, send us feedback through survey, comment this blog post, or reach us at hello@typetastic.com. ← All Fingers Aboard Gets Those Fingers Moving!